iMovie 09 allows you to add transitions to your iMovie projects. iMovie includes a surprising array of transitions, including old favorites (such as Fade In and Dissolve) and some nifty stuff you might not be familiar with (such as Cube and Page Curl). To display your transition collection, click the Show Transitions button on the Browser toolbar (or press Command+4). Add transitions between clips in iMovie. To see what a particular transition looks like, move your mouse pointer over the thumbnail to display the transition in miniature. Adding a transition couldn’t be easier: Drag the transition from the list in the Transitions Browser pane and drop it between clips or between a clip and a still image in the Project pane. 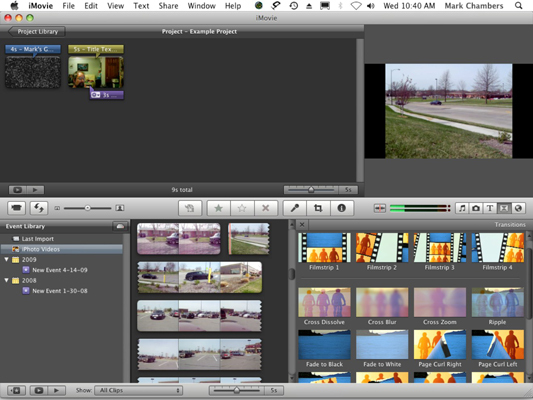 In iMovie 09, transitions are applied in real time.